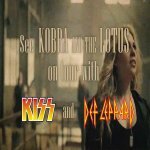 Kobra And The Lotus will support Def Leppard and KISS for 23 shows on their Summer Tour 2014. They will play 23 shows starting on day 23rd June 2014 in West Valley City/Salt Lake City, UT and ending on 12th August in Toronto, ON. No support has been announced for the other 19 dates as yet. And also no word on the secret show mentioned by Joe a few weeks ago. The band were discovered by Gene Simmons of KISS which explains their inclusion on the tour. Watch the video below which announces their support slot and features a few words from Gene himself. Their album 'High Priestess' is released on 24th June. Gene Simmons - "Take note the metal goddess has arrived her name is Kobra Paige. Beware Kobra And The Lotus."